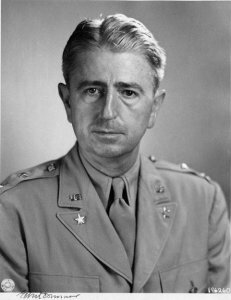 The Pacific War Online Encyclopedia: Wedemeyer, Albert C.
Albert Wedemeyer ws born in Nebraska and graduated from West Point in 1918, seeing no combat in the First World War. He served in China in 1930-32 and became fluent in the language. He was a 1936 graduate of the Command and General Staff School and attended the German Kriegsakademie in 1936-1938. Probably the Army’s foremost expert on the German war machine, he spoiled his usefulness through his strong isolationist stance and his Anglophobia, which gave him the appearance of a German sympathizer and made him a prime suspect in several leaks of U.S. war plans to the press before war broke out in the Pacific. The most serious such leak was of the Victory Program, Wedemeyer's contingency plan for war with Germany if the U.S. was unable to remain neutral. One of the 35 copies of the plan found its way into the hands of Robert McCormick's Chicago Tribune, which published portions of the plan on 4 December 1941, just three days before war broke out in the Pacific. FBI investigators never determined how the plan was leaked, but Wedemeyer remained under a cloud of suspicion of having leaked his own report. Wemeyer insisted to the end of his life that he had nothing to do with the leaks, and he credited Marshall with providing the crucial support that saved his career. Fleming (2001) claims to have traced the leak as far back as "Hap" Arnold, chief of the Army Air Forces, and suggests that Roosevelt himself leaked the Victory Program, as a way to provoke Germany into declaring war on the United States if the United States found itself at war with Japan. Wedemeyer remained in the war plans division in Washington until September 1943, when he was promoted to major general. He served briefly as an observer in Europe, and then was sent to India to serve as deputy chief of staff under Mountbatten in October 1943. In October 1944, he relieved Stilwell as chief of staff and chief American military advisor to Chiang Kai-shek after the latter insisted on Stilwell’s recall. (Stilwell's other titles, deputy commander of SEAC and Northern Combat Area commander, went to Wheeler and Sultan.) Wedemeyer served in China the remainder of the war. He was promoted to lieutenant general in January 1945. Postwar, Wedemeyer was given command of 2 Army and joined Marshall on his mission to China. Wedemeyer correctly predicted the Communist victory in the civil war, which he blamed on the failure of the United States to give effective support to the Kuomintang. He was commander of 6 Army until his retirement in July 1951, where he became active in Republican politics and on the boards of several corporations. He was awarded the Presidential Medal of Freedom in 1985. Wedemeyer stood 6'5" (196 cm) and was described by Roosevelt's chief of staff, Admiral William Leahy, as a man of "superlative integrity" (Fleming 2001). This was not a universal view. While serving as one of Marshall's senior planners, Wedemeyer installed a secret tape record in his desk with which he recorded his conversations with British officers from the Joint Planning Staff. Allen (1984) described him as "ambitious and conceited" and Stilwell wrote in his diary in June 1944: "Good G-d — to be ousted in favor of Wedemeyer — that would be a disgrace" (Allen 1984). Graduates from West Point, standing 270th in a class of 285.